I know that my posts about Elizabeth Warren’s proposed wealth tax have left you mesmerized and waiting for more. I’m here to help. Let’s suppose that a wealth tax is unconstitutional. Or more to the point, let’s say that we don’t want to risk a showdown with a conservative Supreme Court that would probably find some way to strike down a wealth tax regardless of what legal scholars say about it. How can we enact the equivalent of a wealth tax but do it in a way that’s constitutionally unassailable? Ari Glogower of Ohio State has released a draft paper with a set of options that he calls Wealth Integration. The basic idea is fairly simple: in the same way that income taxes can be based on, say, your marriage status, they can also be based on other things unrelated to income. For example, they can be based on your net worth. Glogower’s three options are to vary either deductions, credits, or the tax rate based on your total wealth. These are all conceptually similar, and there’s no reason you couldn’t do all three at once if that’s what worked best. But the simplest is to vary the tax rate, so let’s take a look at that. Suppose Mr. Rich has $1 billion in wealth and we want to tax the amount over $50 million at 2 percent. That’s $19 million. If Mr. Rich also has $100 million in income, we could get the same amount by taxing the income above $5 million at a rate 20 percent higher than normal. Simple. 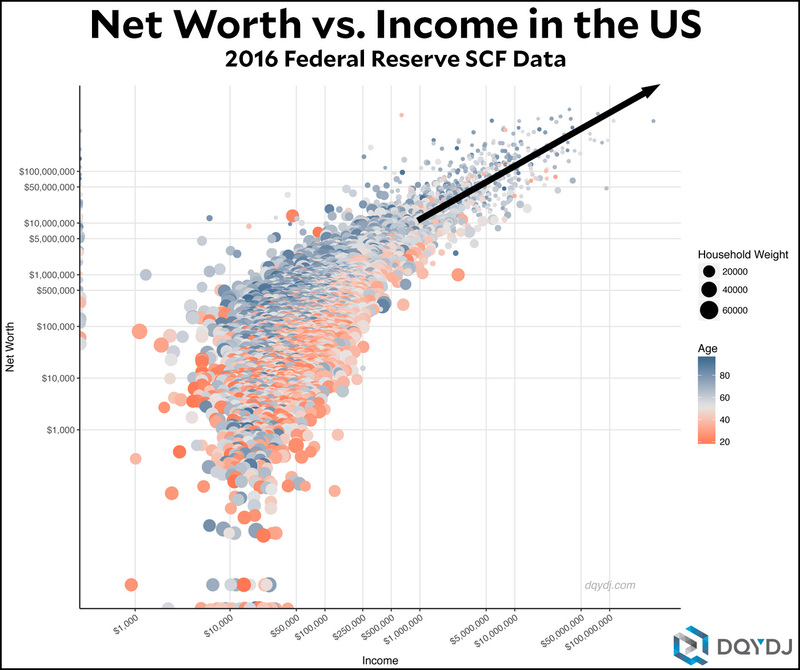 As you can see, the overall correlation between income and wealth isn’t very tight if you look at the entire range of incomes. However, if you look only at the very wealthy, the plot is fairly scattered but pretty linear at around 10:1. Very roughly speaking, someone with a wealth of $100 million probably has an income of about $10 million. Someone with a wealth of $500 million probably has an income around $50 million. Etc. Basically, to effectively tax wealth all you need to do is implement a surtax on income that rises as total wealth rises. Given the 10:1 correlation between wealth and income, the surtax on income would need to be in the range of 20 percent if your goal is a 2 percent tax on wealth. Alternatively, you could ignore actual wealth and simply implement a surtax of 20 percent on all income over $5 million. That would—again, very roughly—be equivalent to a 2 percent tax on all wealth above $50 million. Obviously there are lots of gotchas here, and no substitute for a wealth tax will ever have exactly the same incidence as a wealth tax itself. There would also be loads of deductions and credits to think about, but a straight wealth tax would probably have those too. The point here isn’t to present a well-thought-out proposal for a presidential white paper, it’s just to show that there are ways to indirectly tax wealth in ways that wouldn’t run afoul of the Supreme Court.¹ This is one way, and there are plenty of others. Whether a wealth tax is a good idea is a whole different discussion. There are all sorts of issues related to tax avoidance, capital accumulation, and so forth that need some serious thought. But it can be done if we want to do it. ¹Glogower spends a fair amount of time making a case that the Supreme Court, even if it desperately wanted to, simply couldn’t overturn a tax like the one he proposes. The short explanation is that it would blow up too many settled areas of tax law. The long version is in the paper if you’re interested.